Making Homemade Applesauce is easy using a Foley Food Mill, especially if you are planning on freezing or preserving it by canning applesauce. 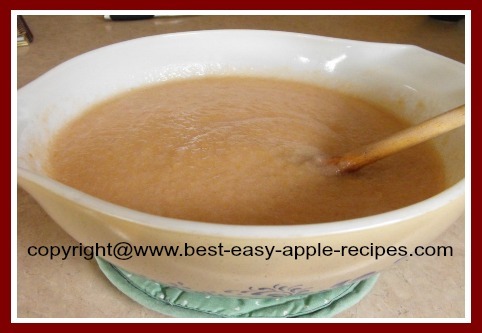 For other methods for making homemade applesauce, scroll down. How many apples do you need to make large quantities of applesauce for preserving it by canning or freezing applesauce? A rough estimate is that, to make 16 quarts or litres of applesauce, you will need about 1 bushel, or 42 - 48 pounds of apples. In my experience, one large "Dutch oven" size pan makes about 2 quarts or 2 litres of applesauce. See Also: How Many Apples Do I Need? See Also: What Varieties of Apples are Best? 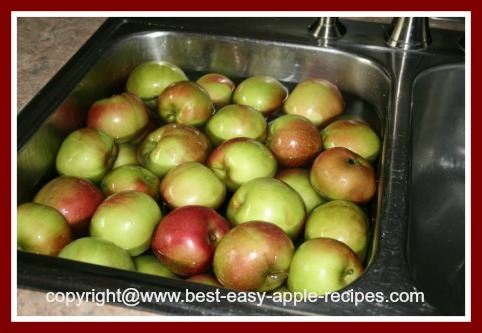 Wash the apples in the kitchen sink. Using a sharp paring knife, quarter each apple, being sure to remove the stem and the flower end piece. Do not remove the peel, nor the seeds or core. 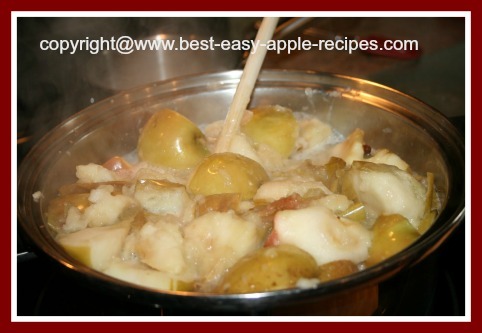 As you perform Step 2 (above), add the quartered apples to a large "Dutch Oven" size pan or equivalent. Do not fill pan more than 3/4 full. Add the water to the pan with apples. Using medium-high heat bring the apples and water to a boil, then when water boils, reduce the heat to medium low, and allow the apples to simmer for about 20 minutes, or until they are soft/tender. Remove the pan from the heat, and process the apples (and water) through the Foley Food Mill, or through another Mechanical Food Strainer such as a Victorio Strainer or a Strainer Attachment for a KitchenAid Stand Mixer. Place the Foley Food Mill over-top of a large size bowl. 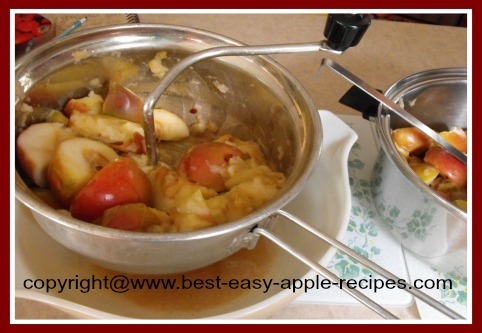 Using a large size ladle, transfer the cooked apples (and water) (in batches) to the inside of the Food Mill. Process the apples using the hand crank. As the apples are crushed and forced through the strainer, the applesauce will fill the bowl, while the apple peel, cores, seeds, etc. remain inside the Food Mill. 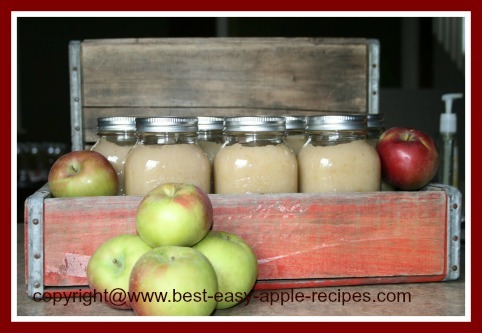 Making Applesauce is a Great Idea for Homemade Baby Food Too! When all the apples have been process through the Mill, use your hand to remove the left over pulp and peel and discard. 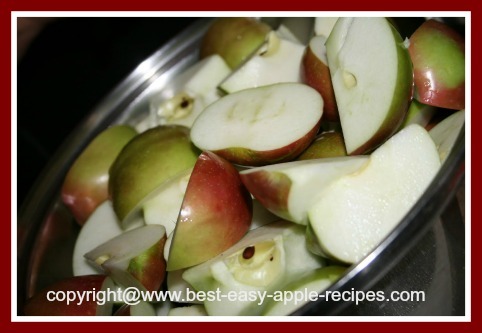 If you are processing large amounts of apples, you will need to empty the Mill after every pan of processed apples. Store the fresh applesauce in the refrigerator for up to one week. If you are planning to freeze the applesauce, allow it to cool slightly and then transfer it to freezer-safe containers or bags. Store in the freezer for up to one year (or more!). You can add additional flavourings to homemade applesauce, depending on your likes and dislikes. Common flavourings include (per 8 apples) - a teaspoon of grated lemon zest or vanilla extract, or 1/4 teaspoon of cinnamon or nutmeg. I like to make the applesauce plain, without any flavourings, and then have a jar of a mixture of sugar and cinnamon on the table so that those who prefer a sprinkling of cinnamon on top of their applesauce serving have that option.